While I have made some great Indian food, Rob’s kitchen territory reigns in India. He loves spicy and anything curry, whereas I prefer dishes that are more mild and don’t have that curry flavour that we still have yet to pin down to a specific spice (?asafoetida ?peppercorns ?amchoor). Now that we will be sharing more meals together, we are trying to compromise with our meals. Hence, my plethora of curries! 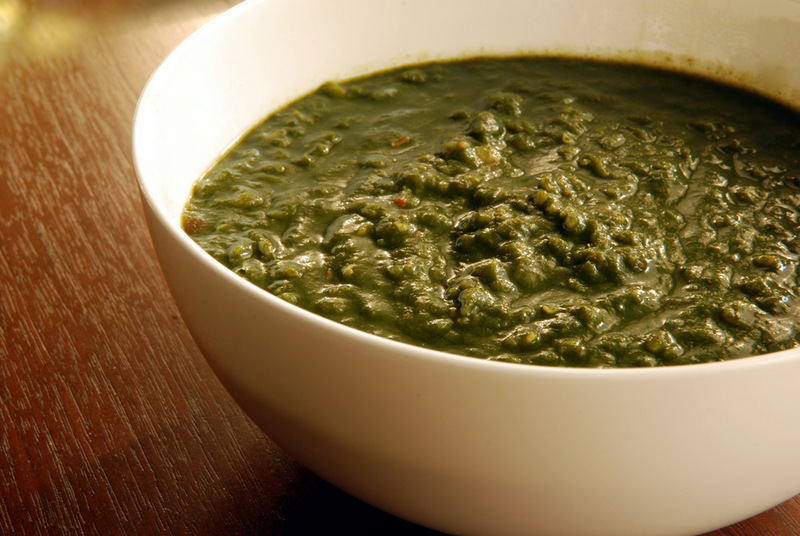 I decided to make dal palak, a classic Indian lentil dish jam-packed with spinach. No curry powder in the recipe? Perfect! I was still a bit hesitant to try the dish, despite its rave reviews, because I have had a similar paneer-based dish at a friend’s house. They knew I had a sensitive palate, but had to throw in chilis for flavour, they told me. For me, it was too earthy and too spicy. A true Indian family, they told me it was the blandest food they had ever made! I ate what I could, which wasn’t much. So with this hesitation, I was cursing as I had nearly every burner going on the stove plus the food processor and spice grinder. 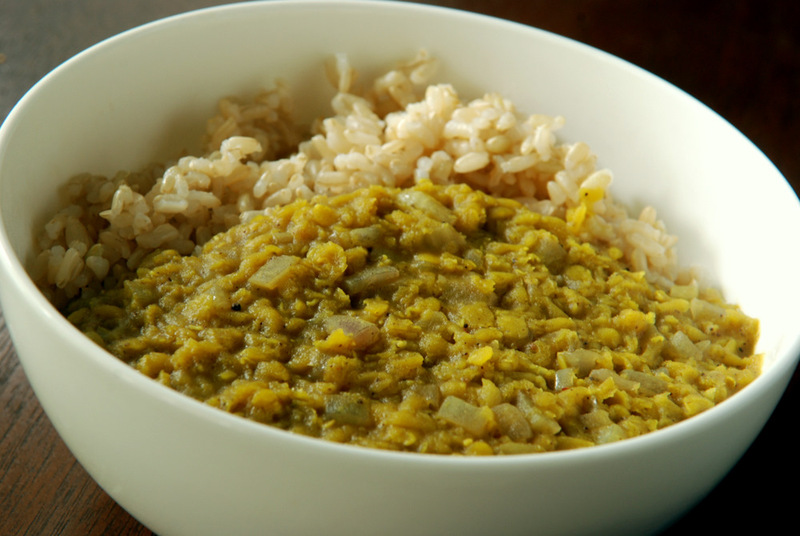 This multi-step meal requires a steamed spinach paste that is combined with soft red lentils and spiced with a fragrant mixture of garlic, shallots, ginger, cumin, coriander, turmeric and lime juice. Just a hint of spice from the Aleppo chili flakes. While I was initially cursing, this all dissipated when I finally sampled the dish. This was glorious. 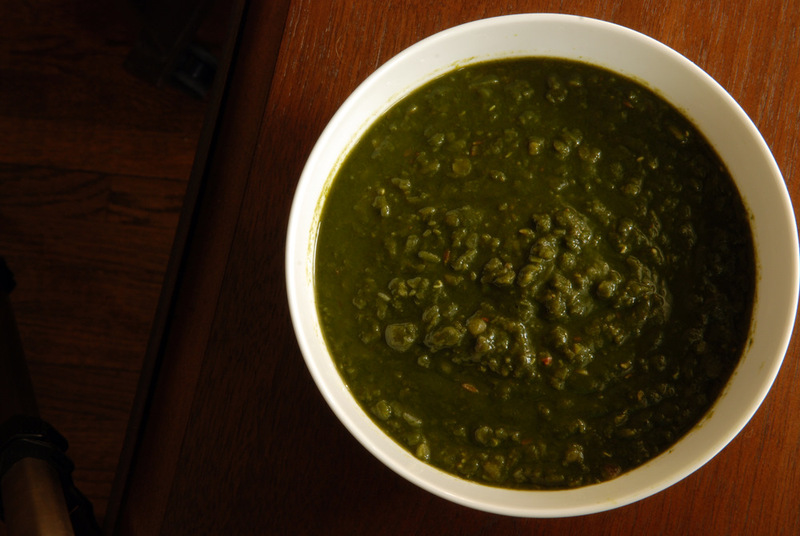 The fresh spinach and freshly ground coriander seeds were sweet and it was balanced by the earthy, but not heavy cumin. The fresh lime juice brought this to the next level. I never knew Indian food could taste so good with such limited ingredients. It wasn’t laden in oil, it was bursting in a creamy spinach soupy mixture. I ate it as is, similar to a stew, but it would be great combined with brown basmati rice, or served with some paratha or roti. Curries are actually really varied. Considering curry simply means something has been simmered in a sauce with spices/herbs, it can encompass many different kinds of meals. They are a heterogeneous bunch and hail from India and Nepal to Thailand to Great Britain, Japan and even Trinidad and Guyana. They can be quite different and for those who shun at the sight of curry on a menu or in a recipe (yes, count me in on that), I wanted to highlight beginner-friendly curries this week. Curries for those who do not like curries. Like me. If these are my favourite curries so far, then you can be assured that you will love them, too. While I am still averse to eating curries in restaurants, I had a favourite Indian restaurant in my pre-vegan days. It was at Amaya that I fell in love with flavourful Indian cooking. Instead of over the top earthy and spicy dishes, I could taste layers of flavour. I still want to know how to recreate their butter chicken at home (without resorting to chicken, cream and butter, obviously! ), but have yet to crack that recipe. I know there are others like me that quiver when they hear the word curry, not knowing what it will taste like. Will it be hot or spicy? Will it be earthy? Sweet? Creamy? Each component makes a difference and can make me wax from loving a dish to wane and hating it altogether. 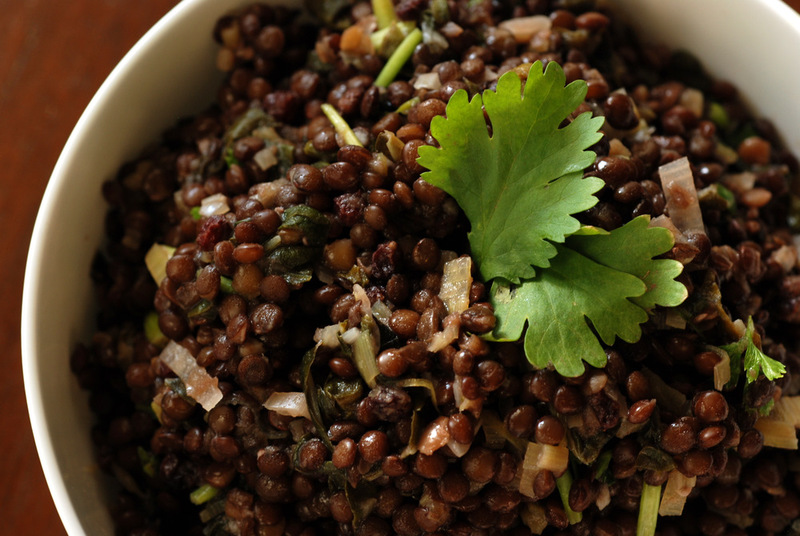 Remember the 11-Spiced Lentil Salad? You essentially make your own curry powder with all the spices, but had Sarah called it Curried Lentil Salad, I never would have made it. But I am so glad I did, since the flavours were all right up my alley. 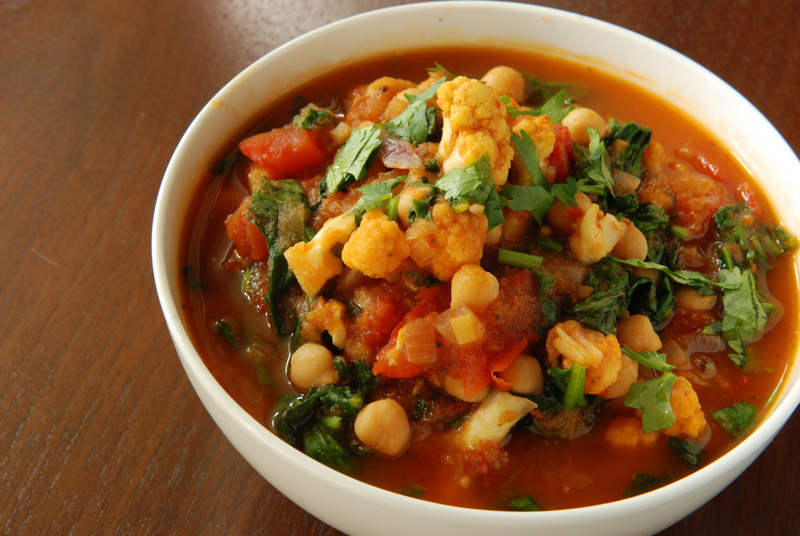 For those like me, or for anyone who wants to make a delicious flavourful curry, try this one: vegetable balti. Named after a cooking vessel or the Baltistan area in Pakistan, its origins are debated, hailing from Birmingham in Britain but possibly originally created in Pakistan. Baltis can incorporate lamb or chicken, but in this case, I feature it with tomatoes, cauliflower and spinach. Regardless, it is the sauce that counts. I hesitate to call it a curry sauce, because honestly it is a deliciously spiced tomato slurry that is the star of the show. With my adapted recipe below, it is more sweet and savoury than spicy but there is a backdrop of spice. Dial up the heat to your taste, but I loved it exactly as written. The dash of garam masala added after cooking was a neat twist. 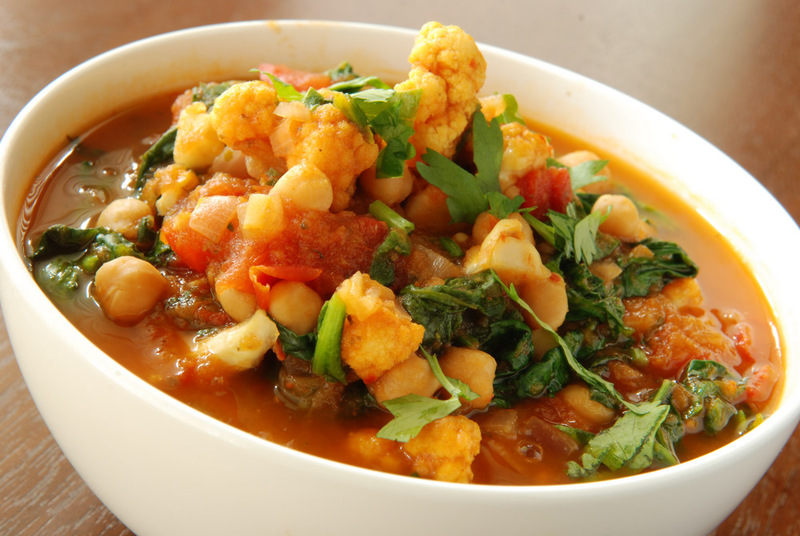 The savoury tomato curry sauce smothers chickpeas, chopped tomatoes, crisp cauliflower and loads of spinach. 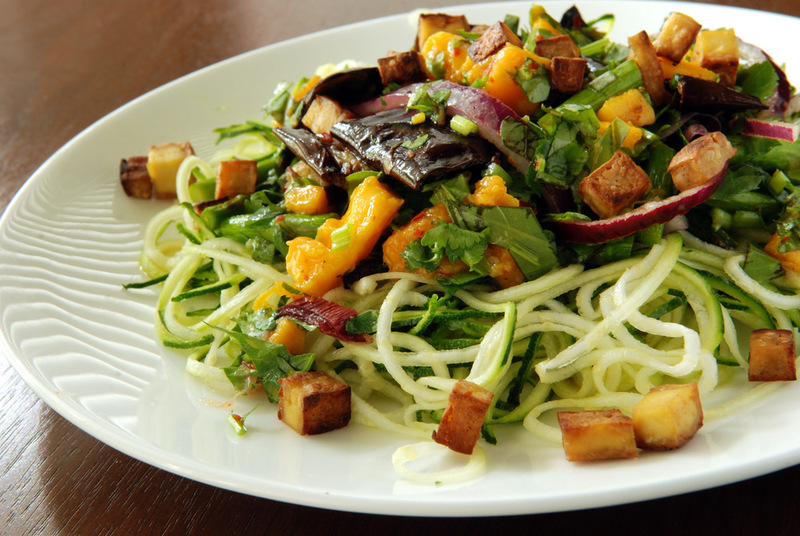 You could use any vegetables you prefer, including green beans, eggplant, zucchini or sweet potatoes. Balti curries tend to be a bit more soupy because they are supposed to be eaten with bread like naan, instead of rice. This is my submission to My Kitchen, My World for Britain, to E.A.T. World for Britain, to this month’s Simple and in Season, and to Ricki’s Wellness Weekends. My friend will be hiking up to the Mount Everest base camp in a few weeks. Last month, Rob and I joined her for a morning weekend hike starting at Hilton Falls. Rob picked out a nice trail. Just a short 8km hike, he told us. It will probably take 2 hours. I love hiking, but let’s just say that I was woefully unprepared for this hike. However, this wasn’t an 8km 2 hour hike. It turned out to be a rocky 13km hike that took 4.5 hours! Regardless, the scenery was nice, the route challenging and more importantly, we were able to chat about my friend’s impending trip. Of course, we also talked about food. 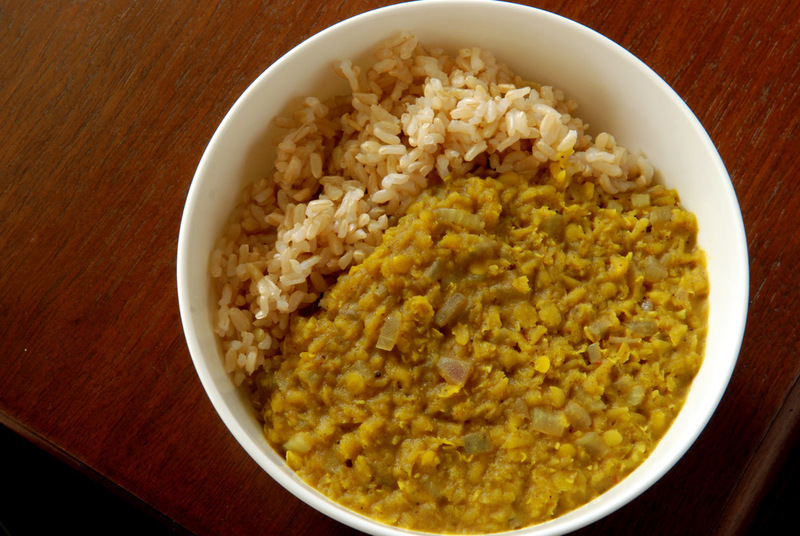 She’ll be eating a lot of dal bhat, which is Nepal’s traditional dish with lentils and rice. She has yet to take us up on our offer to preview Nepalese cuisine, but after remembering what a nice, soothing dish it was, I asked Rob to make it when I was feeling unwell. Rob did a double-take as well. Me? Asking for a curry when feeling sick? I wanted something soothing, comforting and porridge-like, akin to my quinoa and red lentil kitchari. I wanted something on the blander side but still with some flavour. Curries do not have to have lots of pepper (especially if you make them yourself), which is why dal bhat definitely hit the spot, and kicking off my week of beginner curries. Curries for people who don’t like curry. This recipe was adapted from Mangoes and Curry Leaves, where we swapped in red lentils, decreased the water and fiddled with the chili peppers. Otherwise, the warming spices including coriander, cumin, cloves, cinnamon and cardamom create a soothing palate. 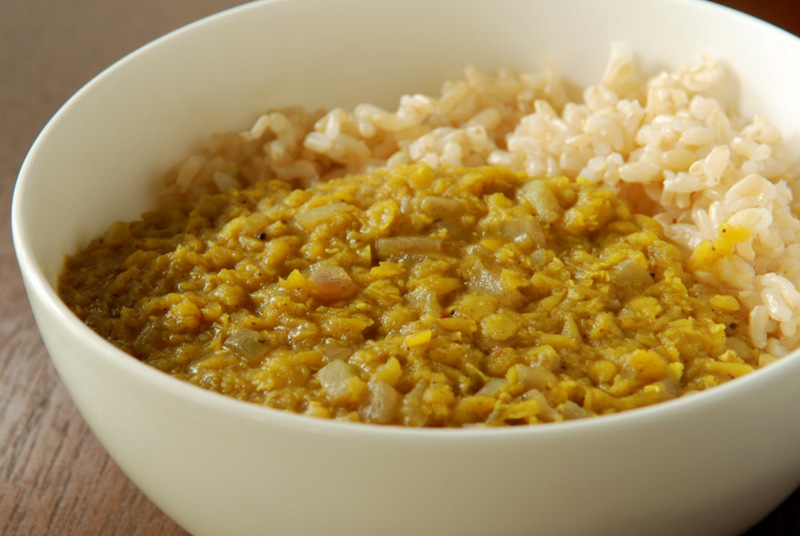 Quick cooking red lentils make this a nice meal that can easily be added to your meal rotation. 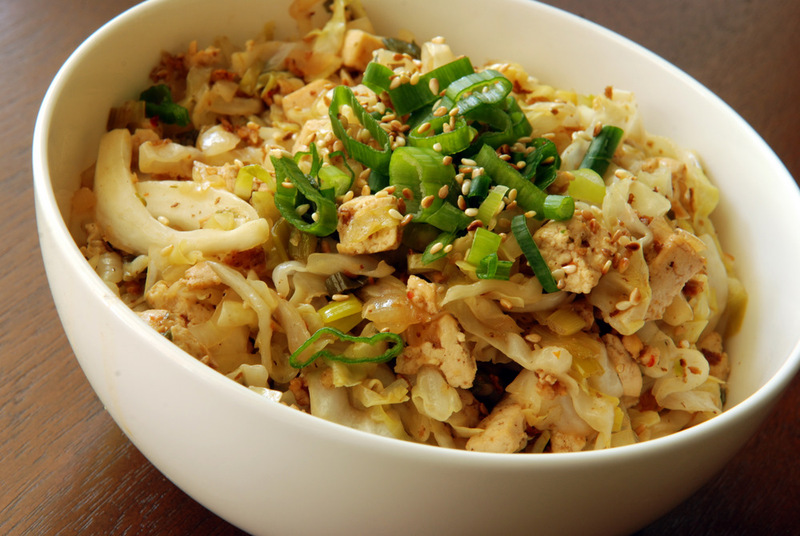 Or if you are hiking up Mount Everest, a delicious meal to sustain you up the mountainous climb. As with all curries, the leftovers are even more wonderful as the flavours meld further and thicken up with the rice. This is my submission to E.A.T. World for Nepal, to this week’s Potluck Party for Best Dish and to Ricki’s Summer Wellness Weekends. This week, my belly needed a rest. After a few Ottolenghi and Cotter recipes, literally bursting with flavour, as well as a potluck dinner that left me in pain, I knew I needed some tummy down-time. I didn’t even want to cook, it was that bad. Thankfully, Rob was eager to make me a nice, simple Nepalese lentil and rice dish (recipe to come!). When I finally had the motivation to turn to the kitchen myself, I still didn’t want an elaborate meal. I wanted something homely and comforting. I didn’t want too many flavours. I wanted something simple. Enter another spin on lentils and rice, Middle Eastern-style. In Olive Trees and Honey, Gil Marks outlines the progression of lentil and rice dishes from different cuisines. 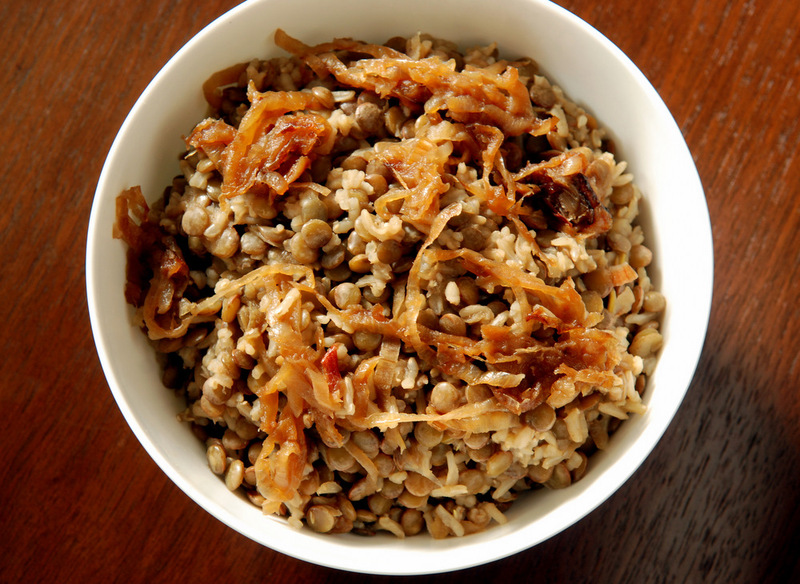 Apparently, the traditional version of lentils and rice with caramelized onions from Turkey is called Mengedarrah, whereas Mujaddara (which is what I thought I was making) is from the Levant and spiced with allspice. Then you have the Indian khichri/kitchree with cumin and garam masala. Or the Egyptian version, koshari, with noodles such as macaroni or spaghetti with tomato sauce. The book actually has a map that chronicles the name changes as well: kichree in Iraq, ados pol in Iran, mejedra in Greece, enjadara in Yemen and jurot in Uzbekistan. I wonder how my bastardized red lentil and quinoa kitchari fits into this? There are a few ways to tackle this dish, and I think I’ve discovered my favourite way. You could cook your lentils and rice separately, although in my case the rice cooker was already in use and we all know I have trouble cooking rice on the stovetop. More traditionally, though, some recipes, including the one in Olive Trees and Honey, recommend partially cooking the lentils, then removing all of the cooking water, then returning the proper amount of water to cook the rice with the lentils. This is necessary when using white rice since the rice would be finished before the lentils. However, brown basmati rice and green lentils take nearly the same amount of time to cook, which lends to a perfect match and less fuss. So, I simmered my brown basmati rice and green lentils with a cinnamon stick. In a separate skillet, I caramelized my onions. You could start the lentils and rice after the caramelized onions are finished so they can get added to the cooking liquid, but I didn’t want to wait. I wanted to cook my onions, low and slow, to get the perfect caramelized onions. Since I had to wait 40 minutes for my lentils and rice, this timed out perfectly. I threw in some onions into the lentil-rice mixture before it finished and kept half for the garnish. Using Rob’s large non-stick wok helped me get perfect caramelized onions, much better than when I added them to my socca with oven-roasted cherry tomatoes. Now, I know this is a deceptive bland looking dish: lentils, rice, onions, cinnamon, smidgen of oil and salt. But it is so much more than that. 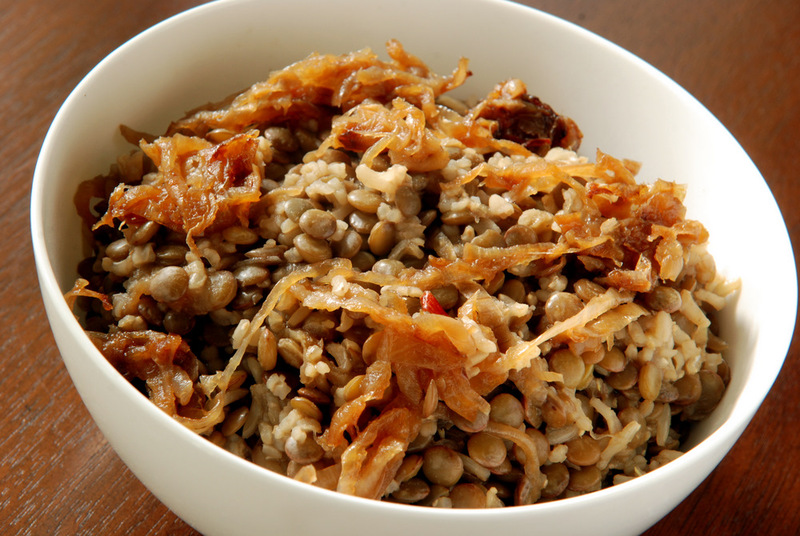 It is a comforting bowl of lentils and rice with sweetness from the onions. The cinnamon is optional but it adds a little depth of flavour. Next time, I may try the Syrian version with allspice, as I have a feeling this may become another potluck favourite – made from pantry items, simple to prepare, tasty, healthy and great as leftovers and served at room temperature. While this seems like a daunting meal with the long caramelization process, it is a simple meal to prepare. This is a great emergency meal to have under your wings, both when you have nothing in the fridge and when you are not feeling well. This is my submission to E.A.T. World for Turkey and to Ricki’s Summer Wellness Weekends. Can you tell I have a few foodie crushes? Tess Challis, the obvious choice. You could possibly surmise I love Ottolenghi‘s recipes. You don’t yet know how much I adore Denis Cotter’s recipes, because I haven’t posted them yet, but I am loving his latest cookbook, For The Love of Food. There is something so unattainable about cookbook authors. I have become smitten by her food, instead. So far, her recipes have not let me down: the raspberry dream cake, the sultry peaches and blueberries, the 11-spiced lentil salad, the raw tacos with walnut meat, cashew sour cream and a cherry tomato salsa and the chickpea salad with the Mexican mango dressing. 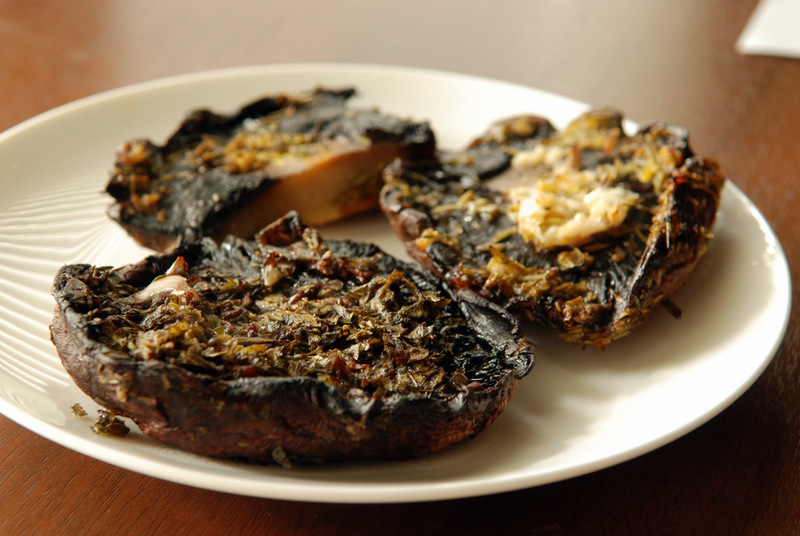 So when I wanted a recipe for grilled portobello mushrooms for the barbecue, I quickly turned to Sarah’s blog. There were heaps of meat for everyone else, so I only made one burger. No worries if it didn’t work out. But of course, there were no failures. The mushroom burger was fabulous. I shared it with Rob so he, too, could relish in the culinary delicacy he had just grilled for me. While I only modified her recipe by decreasing the oil and using fresh herbs, this would also be good with dried herbs when I don’t have them blooming on my patio. After grilling, you have a nicely spiced meaty burger with a balsamic glaze. It didn’t taste like a mushroom, so you could possibly convert mushroom-haters, but you won’t be able to fool anyone into thinking this was meat. But it was surprisingly filling! However, I had one problem. I made one mushroom; I ate one mushroom; I did not photograph said mushroom. Thankfully I had some more portobello mushrooms, so after the hubbub of the party subsided, Rob offered to grill me up some more burgers the next day. 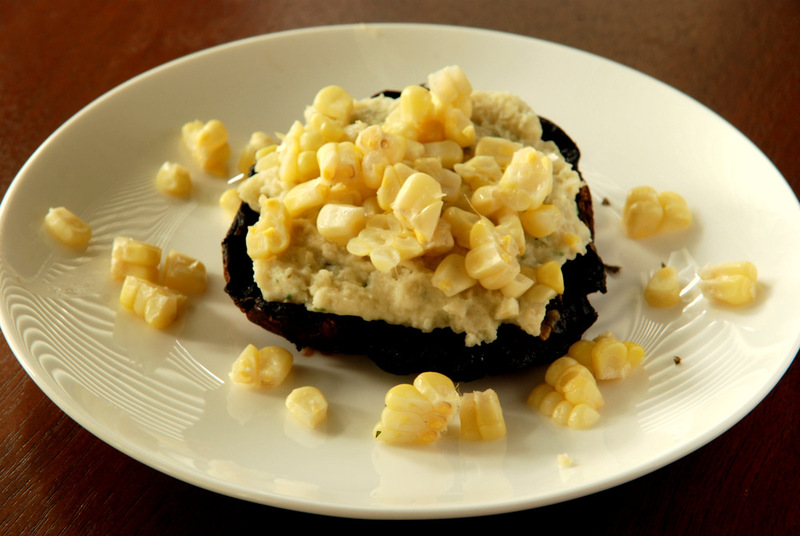 However, this time, I chose to smear it with a white bean puree spiced with thyme and garlic, from Power Foods (recipe also here) and then I sprinkled some leftover corn kernels on top. Now we had a complete meal. And a photograph! Rob prefers hummus to this bean spread, but personally, I found it to be a great twist to a bean spread. The baby lima beans made it creamy with only a touch of oil. The garlic and thyme heightened its flavour, making this a nice and bright spread. Use it just like you would hummus, though: it would be great with raw vegetables, crackers or in a wrap. This is my submission to this month’s My Legume Love Affair, hosted by Preeti, to Ricki’s Summer Wellness Weekends, to this month’s Ingredient Challenge Monday for mushrooms, to this week’s Summer Favourites potluck party, and to this month’s Simple and in Season. I know you’ve heard me lament about resto food. When I first moved to Toronto, one of my favourite restaurants was Fresh. 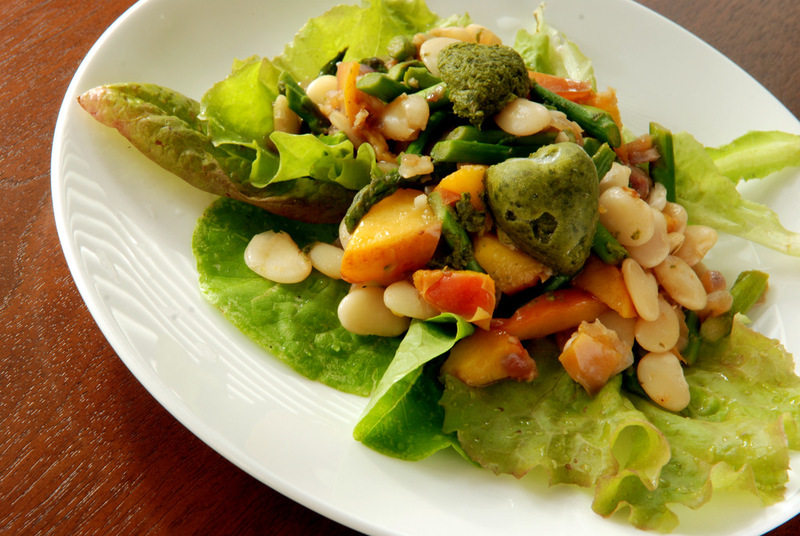 A vegetarian restaurant serving nice salads and wraps. I have since found their dishes hit or miss and usually a miss unless it is the grilled veggie and pesto burrito. Please do not try their soba noodles! A soggy mess that disgraces Japan. However, their sweet potato fries with the miso gravy never disappointed and have rightfully been voted the top sweet potato fries in Toronto. For the BBQ, I made a variety of seasonings for the sweet potato fries. I tried a batch with garlic, lemon pepper and smoked paprika, adapted from a recipe from Radiant Health, Inner Wealth, a batch with a Moroccan spice blend including cinnamon and cumin (somehow my spices went too toasty for my liking [aka burnt], so I didn’t serve them), as well as a one with simple salt and pepper. Other then the Moroccan batch, both turned out great. 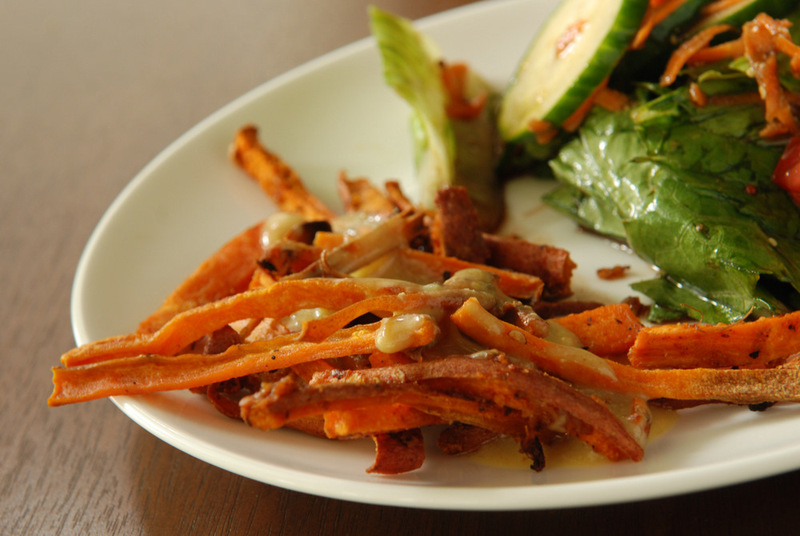 I really liked the roasted bits of garlic with the sweet potato fries. At Fresh, the sweet potato fries are lightly spiced with sea salt, basil, tarragon and rosemary, but the winner was the miso gravy. 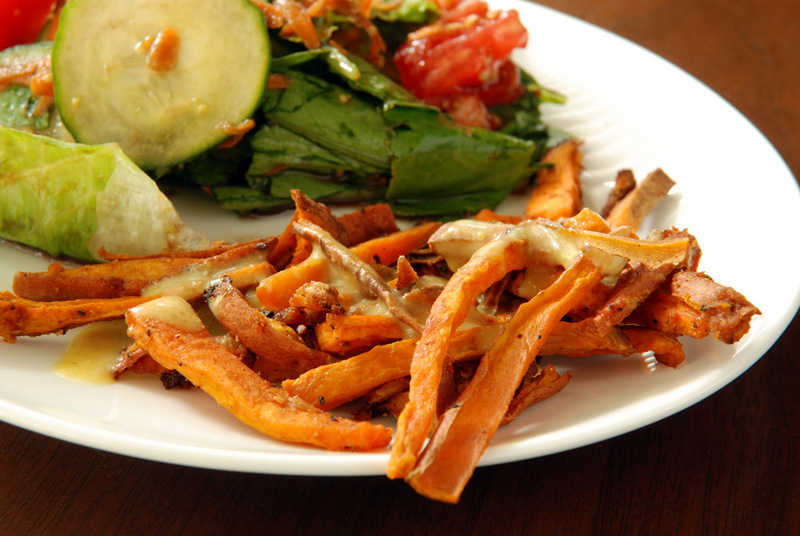 Creamy and salty, it is a perfect match for the sweet fries. This is being submitted to this week’s Weekend Herb Blogging, hosted by Rinku from Cooking in Westchester, to Ricki’s Summer Wellness Weekends and to this month‘s Bookmarked Recipes. Sometimes I wonder why the heck I stress so much! I was testing new recipes for the weekend BBQ, plotting a plan of attack with my Mom, and it all came together seamlessly. My Mom had suggested serving a leafy salad. She figured that was a simple thing to make, but instead, I stressed. I was worried about wasting soggy leftovers and truthfully, I don’t have a go-to salad dressing yet. 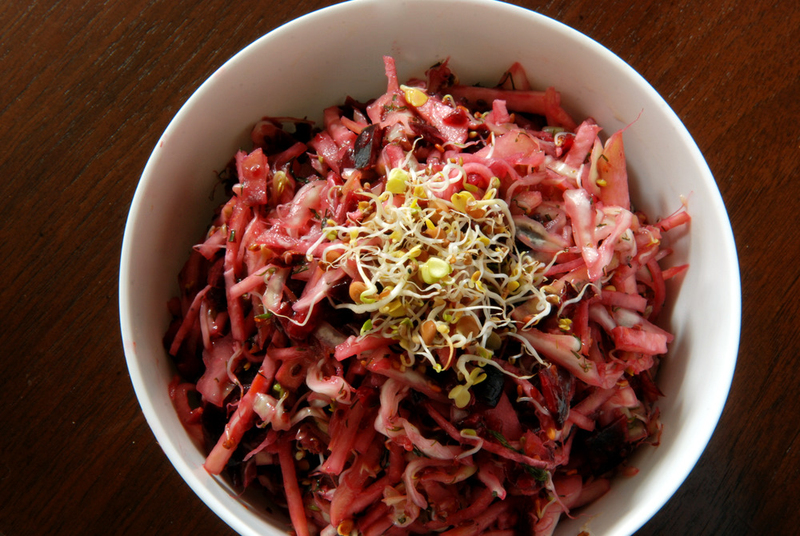 I eat what you see on my blog, and I rarely make simple side salads with a meal. Salad dressings are a simple ratio of oil to vinegar. My family’s traditional vinaigrette employs a 3-2-1 ratio, with 3 parts extra virgin olive oil, to 2 parts vinegar, to 1 part sugar with salt and pepper to taste. However, fortuitously, earlier this week Dawn told me about her new favourite salad dressing, excited because it was oil-free. Super simple. Just as easy with a different 3-2-1 ratio omitting oil. I am sure most people don’t need much guidance in the simple salad dressing component, but I thought this was definitely worthy to share. It is a healthy and vibrant dressing, so totally Janet-style. 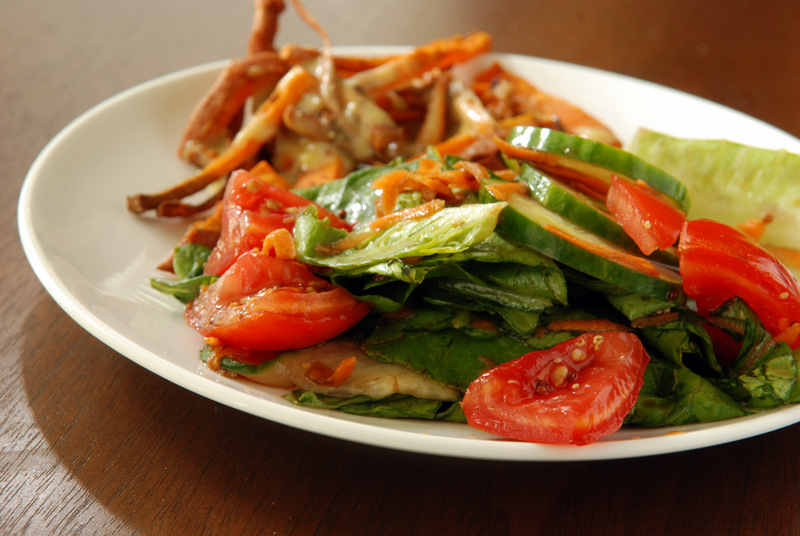 Throw it on top of your favourite leafy greens and enjoy! While I didn’t snap too many photos of the food during the party, I still hope to share some of the recipes. I decided the best way to avoid the Rob-veto (just kidding!) was to simply try some seemingly simple recipes at the time of the party. Thankfully, it all paid off! Along with this salad, I also served the 11-Spice Lentil Salad with Capers and Currants, which is definitely morphing into my signature no-think potluck dish. Everyone really enjoyed it at the barbecue. (I also served it to a bunch of other friends, where I was delighted to see how often people dived in for more, despite eating it with chopsticks – now that takes skill!). I also boiled some fresh corn on the cob. Rob tirelessly tended to the meat at the BBQ, where he also perfectly grilled my roasted portobello mushroom which I served with sweet potato fries and a miso gravy (recipes to come!). 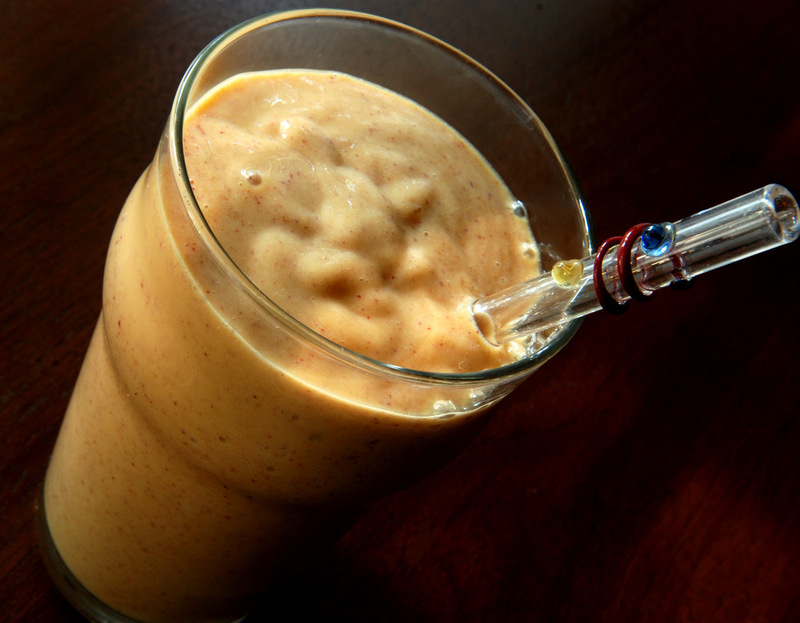 My peach smoothies were also a hit. I had planned to serve watermelon with a mint pesto as dessert, but everyone was stuffed (and how can that compete with the macarons and other treats brought by Rob’s cousin?). Anyways, now that I have this under my belt, it didn’t seem nearly so scary after all! This is my submission to Deb for this week’s Souper Sundays and to Ricki’s Summer Wellness Weekends. My brother and sister-in-law moved into their new condo the week after us. Their place is spotless, nearly everything has been put away, and they are meticulously figuring out which furniture they still want to buy. They are missing dining chairs, though, but told us we could come over for dinner once they arrived. In about…. 16 weeks (eek!!). Rob and I, on the other hand, have a functional house. We combined both of our stuff, miss-matched in all its glory. While the house is mostly functional for day-to-day living, we still have a lot of unpacked boxes in our offices and in the basement. With Rob’s old mattress and boxspring in the living room along with our 3 bikes. But despite that, we have not put our social calendar on hold until we clean house. We are still having fun, opening our messy home to our friends and family as an easy place to gather. 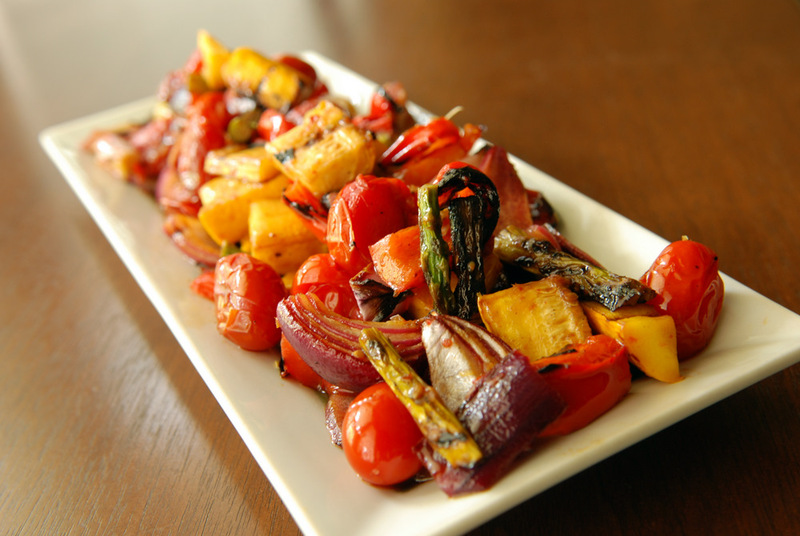 Let me back up a bit: I had a recent hankering for pomegranate-roasted vegetables. 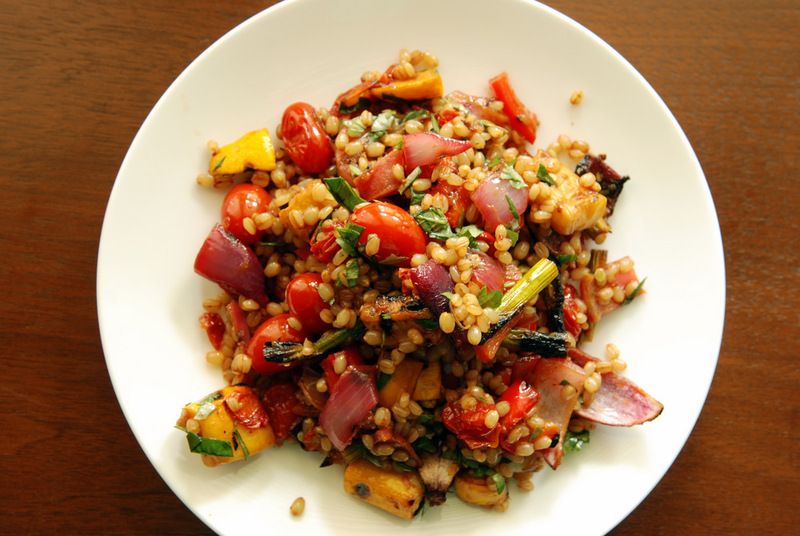 I wanted to add them to a wheat berry salad. 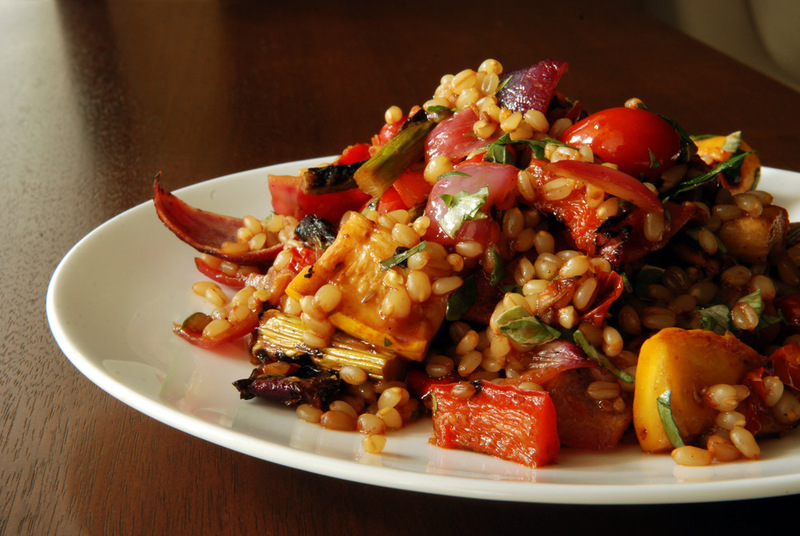 At first, I scoured the web for other pomegranate–grilled vegetables, but then I remembered I already knew the perfect glaze! Last year, I made a delectable pomegranate-glazed salmon that combined a simple glaze of pomegranate molasses with olive oil, but then it was heightened with fresh lemon juice, maple syrup and chopped basil. Therefore, I based my new recipe on that template, adding more pomegranate molasses and less maple syrup, because I wanted a more pronounced deep pomegranate flavour. 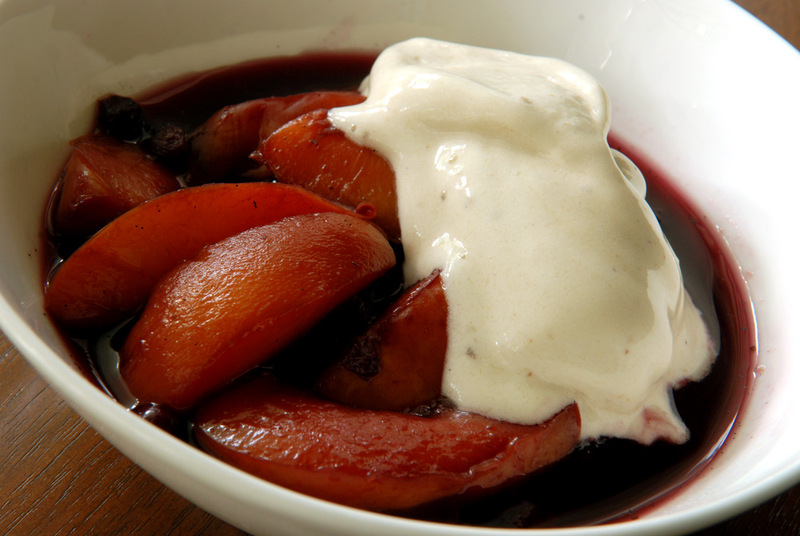 Pomegranate molasses can be tart, so taste as you go. Little did I realize how similar this dressing was to my Turkish Bulgur Salad, of former Best Salad Ever fame. 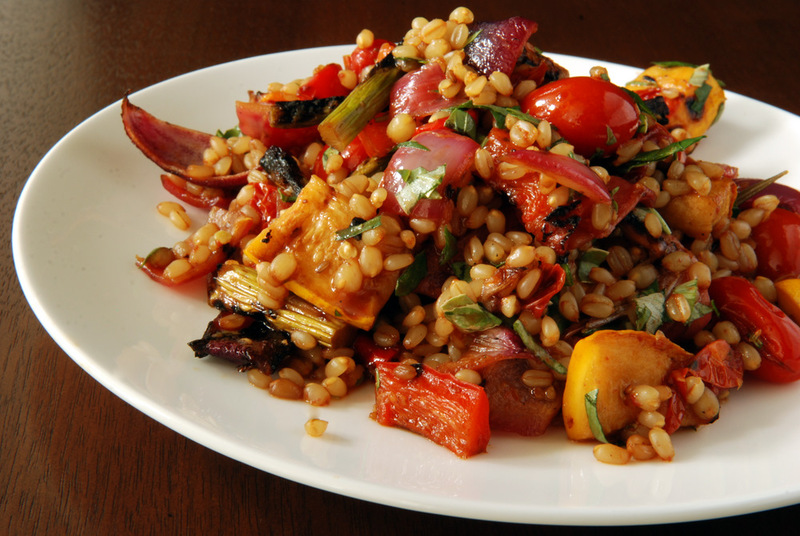 With all the roasted veggies, it is kisir on steroids. Or maybe just a winning Janet original. 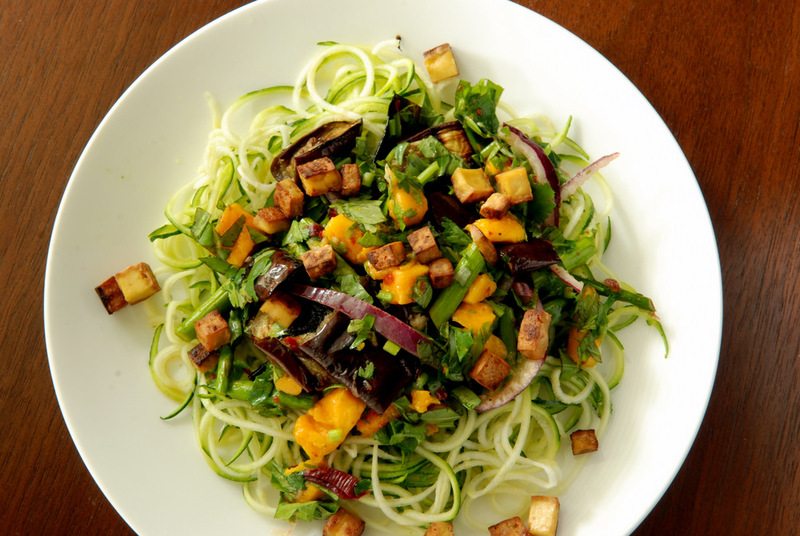 This is my submission to Deb for this week’s Souper Sundays, to this month’s Healing Foods featuring zucchini, to this month’s Simple and in Season and to Ricki’s Summer Wellness Weekends. 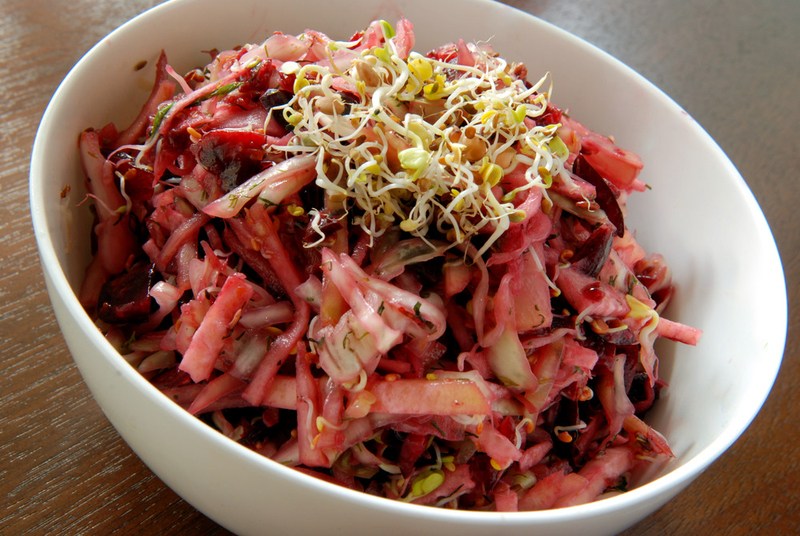 Sometimes I wonder about recipes involving cabbage. A small head of cabbage, they say. Sometimes they specify how much they mean: 1lb. Do heads of cabbage even come that small? I remember Rob coming home with a monster cabbage and it tipped the scales at 5lb. Our last cabbage, which was the smallest in the bunch was 3lb. This leaves us with lots of cabbage! Thankfully it keeps fairly well and still as tasty as leftovers. 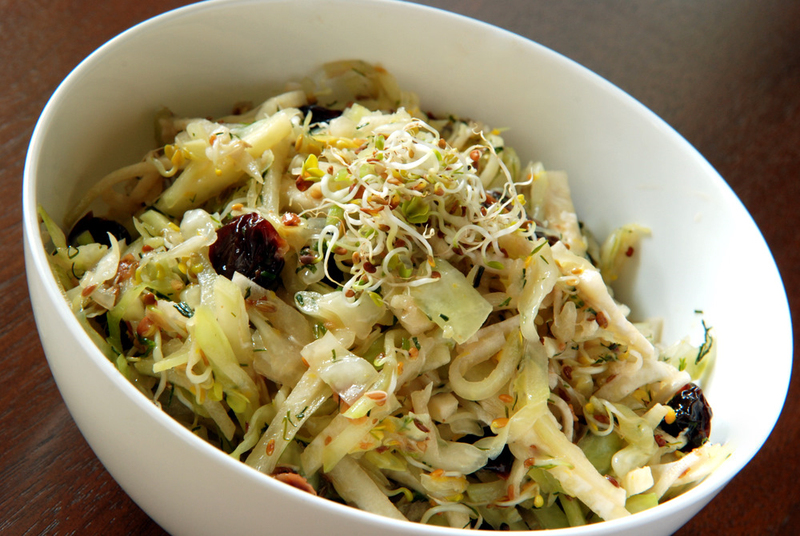 As a neutral palate, cabbage can go into a typical or non-traditional slaw, turn uber sweet after a long braise, bulk up a porridge, add crunch to a salad, or turn Mexican with the right ingredients. This time, I wanted to go Asian. China, of all places, which may not seem to have many healthy options (especially when you head out to a resto). But at home, of course, there are healthy options. You don’t need to add any cornstarch or MSG. It can be flavourful! 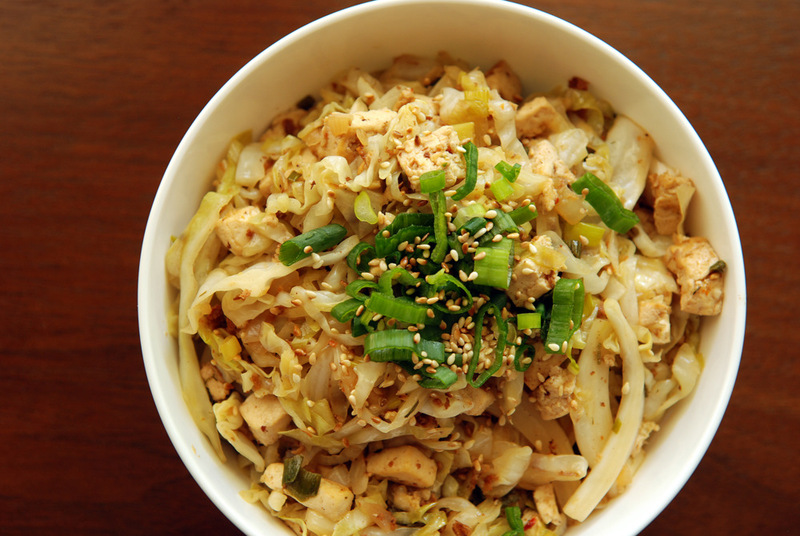 This sweet and sour cabbage dish was adapted from the New York Times. 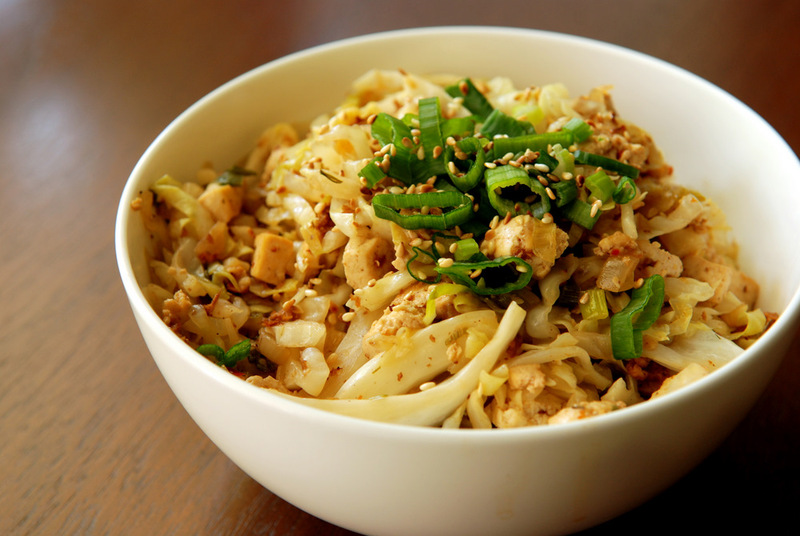 It was light and refreshing, while being nicely spiced with simple ingredients like soy sauce, ginger, green onions and ginger. The toasted sesame seeds are mandatory in my opinion to elevate the dish from bland to grand. I usually press my tofu, but this time I didn’t (it didn’t mention it in the original recipe) and the tofu kind of fell apart because it was quite soft (maybe it was the new kind of tofu I used as well? it didn’t seem to be particularly extra firm). It still tasted delicious but next time, I won’t omit that crucial step. It turns out that the only genetic difference is a single recessive gene that removes the fuzz of a peach, giving nectarines a smooth shiny skin. So basically, they are the same with a different exterior. Fuzz vs no fuzz. My google research suggests that nectarines may have higher concentrations of vitamins A & C as well as potassium, but it certainly varies with the variety of peach and nectarine. Regardless, I love both nectarines and peaches. Substitute between the two for any recipe. My only gripe about these stone fruits is that they are highly perishable when ripe. You need to eat them pronto! 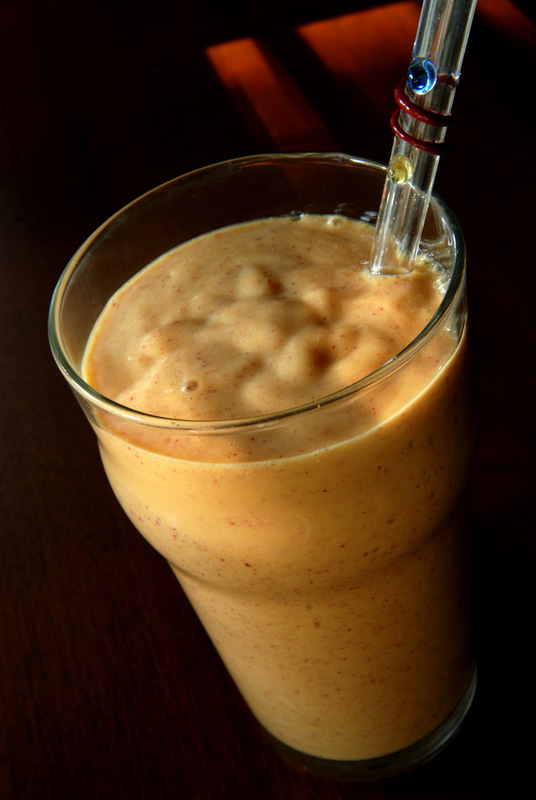 My Peachy Keen Vanilla Smoothie is a delicious way to treat yourself to wonderful peach bliss, and I have also used them to make other desserts like blueberry-peach brown butter muffins, blueberry-peach-raspberry crumbles, and an utterly delicious peach tea cake. 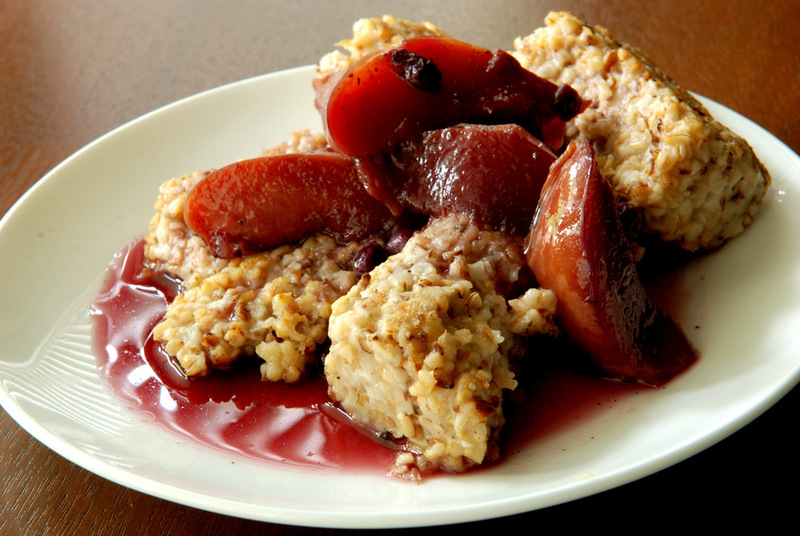 Peach is also wonderful in a salsa, and I have paired it with a maple-chili grilled tofu previously. Here, I wanted to go savoury with the nectarine. 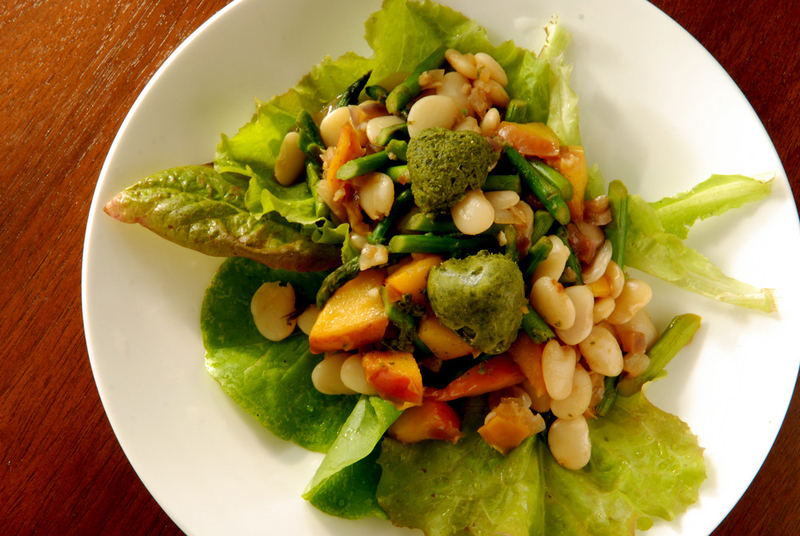 I was immediately drawn to PPK’s Portland Porch Lettuce Wraps, which featured pan-seared asparagus, nectarine and white beans with pesto in a lettuce wrap. I had been distracted from the asparagus, but vowed to get some more to make this. I wasn’t disappointed. I modified Isa’s recipe slightly as I ran out of shallots, and I substituted with a mix of white and red onion. I chose baby lima beans as my white bean of choice. She provided a recipe for an edamame pesto, but I opted to use some pesto that I had made earlier and froze in some cute heart-shaped ice cube trays. How cute are they?? So, this dish was a wonderful merriment of sweet, succulent and juicy nectarines with crisp asparagus and creamy white beans with a nice backdrop of caramelized onions. This is delicious, as is, with a side of lettuce, or even something like brown rice or quinoa. 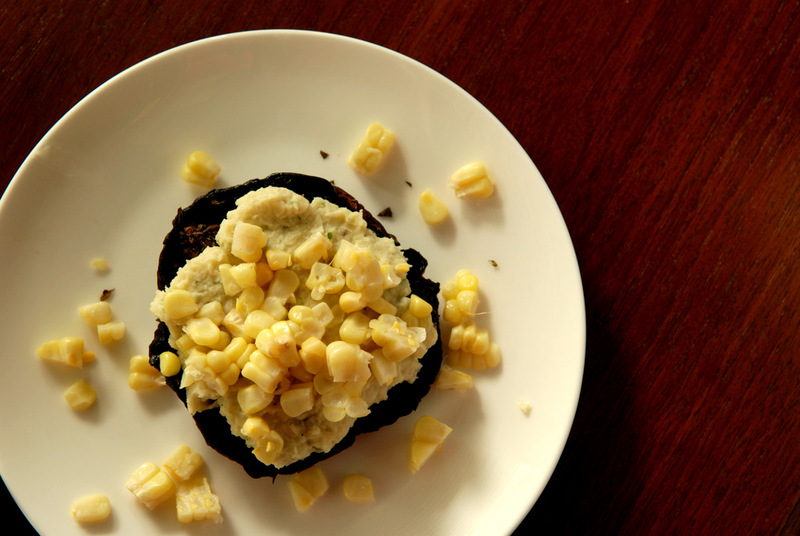 The pesto is not mandatory, as this is great without it, but it is nice with it as well. Basically, don’t hesitate to make this if you are without pesto. I was honoured when Susan at The Well-Seasoned Cook invited me to provide a guest post for her blog, continuing to celebrate the 4th year of My Legume Love Affair. 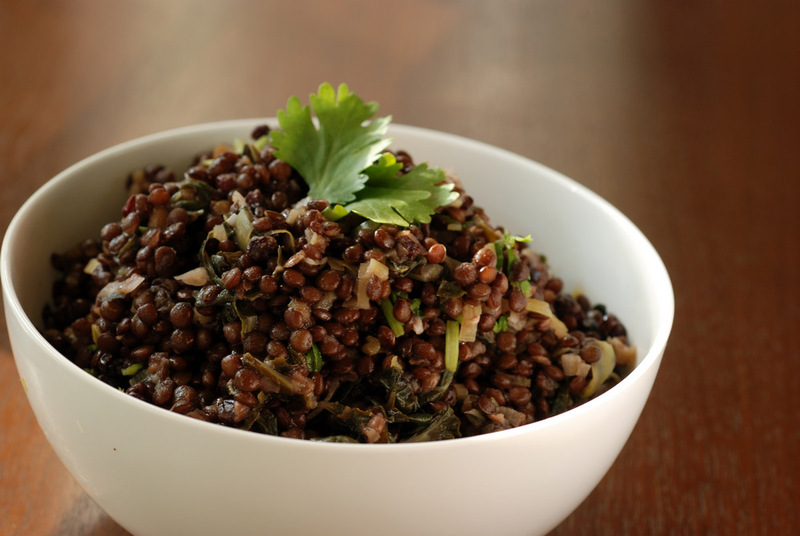 Please head over to her site to hear about my current battle between lentils and chickpeas, and the winning salad I display: Warm Lentil and Swiss Chard Salad.